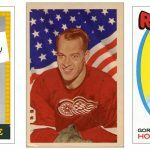 Here we take a look back at the career of the “China Wall,” illustrated with his hockey cards. from the 1950s and 1960s. 1951-52 Cleveland Barons Photo Cards – a team-issued “pre-RC” of Bower. Bower spent eight seasons with the Cleveland Barons. 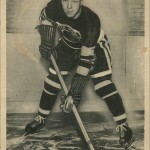 He led the Barons to three Calder Cup Championships in 1948, 1951 and 1953. 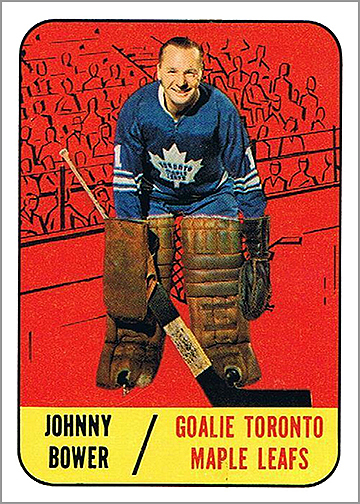 He also was named the AHL’s top goaltender in 1952. 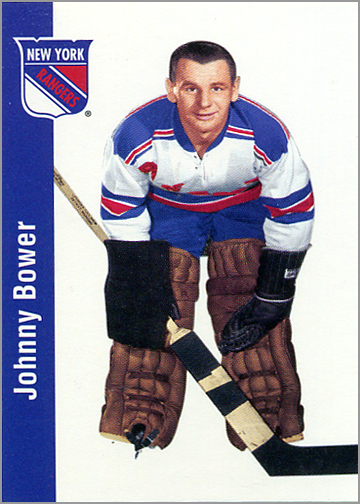 The New York Rangers made Bower their goalie for the 1953-54 season. He played in every minute of all 70 games for the Rangers that season. 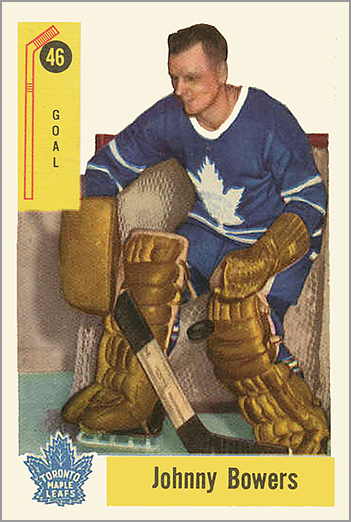 Bower’s rookie card (pictured above) appeared next season in the 1954-55 Parkhurst set. 1994 Parkhurst Missing Link #103. This set was made in 1994 but designed to look like a card from 1956-57. 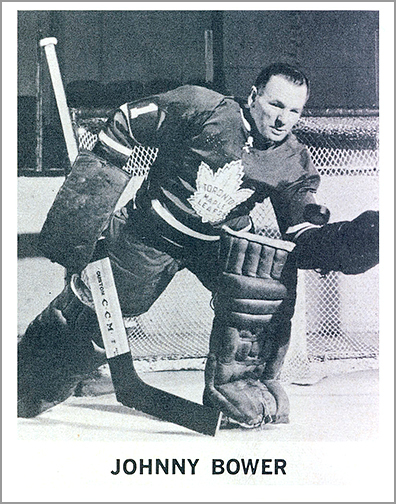 During the ’56-67 season, Bower played in two NHL games. 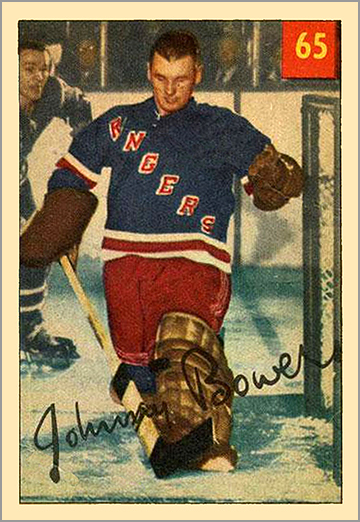 The next four seasons, Bower only saw spot duty with the Rangers, spending most of his time in the minors. He was named the Western League’s best goalie for the 1954-55 season. 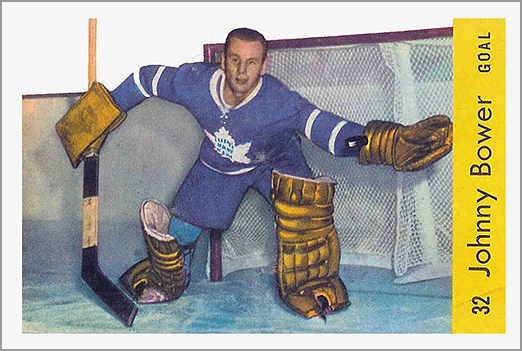 Bower spent the next three seasons in the AHL, and was named the AHL’s best goalie in 1957 and 1958. 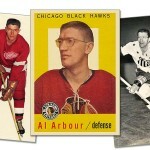 He also won the Les Cunningham Award as the AHL’s best player in 1956, 1957 and 1958. Surely, a player this good couldn’t remain in the American League for much longer. 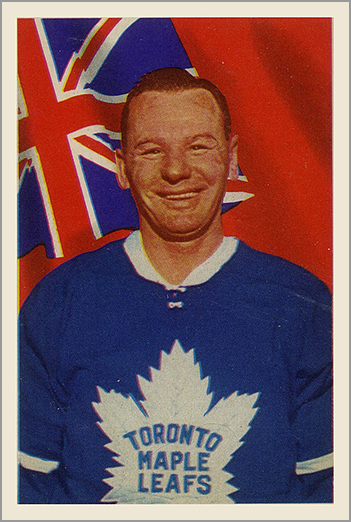 Bower got a second shot in the NHL when the Toronto Maple Leafs claimed him from the Cleveland Barons in the 1958 Inter-League Draft. He played in 39 games, re-establishing himself as an NHL regular. In Bower’s second full season with the Leafs, he played in 66 of 70 games, posted a 2.68 goals-against average and recorded a career-high five shutouts. Six years after his debut with the Rangers, Bower was back to being a number one goalie on an NHL team. 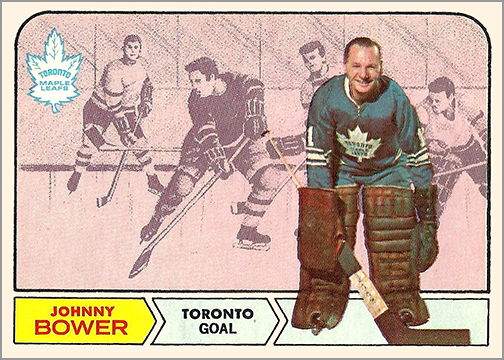 Bower won the Vezina Trophy as the goalie who allowed the fewest goals in the NHL, with a GAA of 2.50. He was also named a First-Team All-Star. 1961-62 Parkhurst #3. Yes, this card does use the same photo as his card from the previous year. 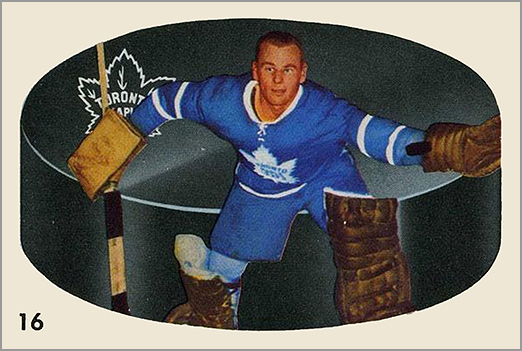 Bower continued as the Leafs’ number one goalie was a big part of the team’s Stanley Cup Championship in 1962. 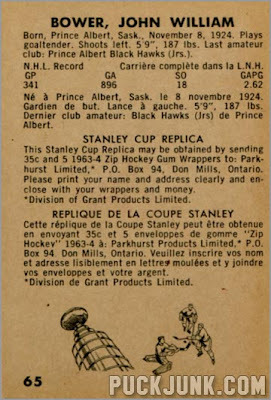 1962-63 Parkhurst #16. 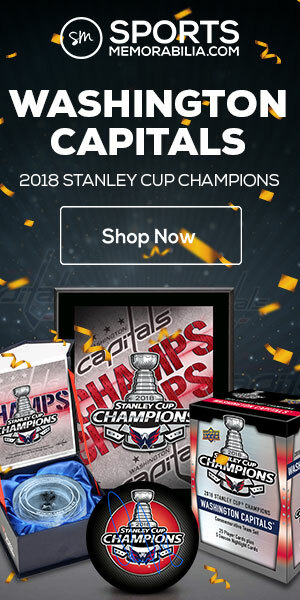 Haven’t we seen this picture somewhere else? 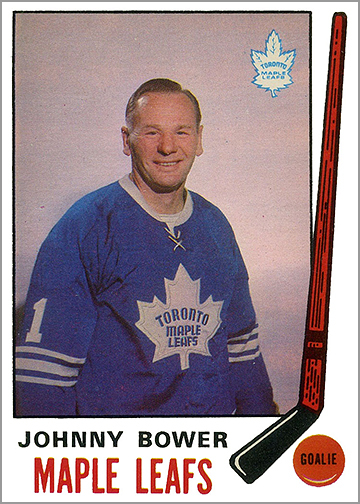 Bower and the Leafs finished first in the NHL during the regular season, and won the Stanley Cup again in 1963. He played in all 10 playoff games for Toronto, posting a 1.60 GAA. Had the NHL awarded the Conn Smythe Trophy for playoff MVP back then, Bower arguably could have won that award, too. 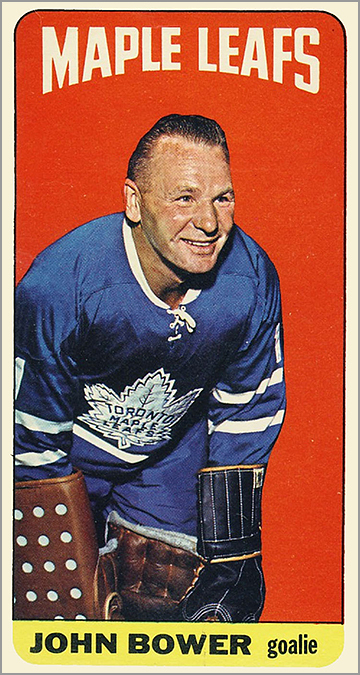 Bower and the Maple Leafs won the Stanley Cup for a third season in a row in 1963-64. He tied his career-best with five shutouts during the regular season. 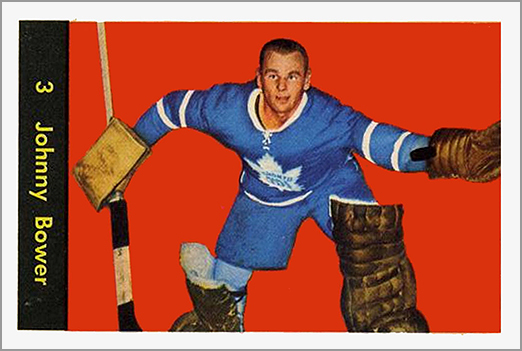 The Maple Leafs brought in Terry Sawchuk in 1964-65, who split games with Bower that season. 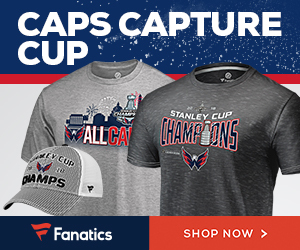 The two combined for the best goals-allowed average in the NHL, and were co-winners of the Vezina Trophy. During the season, Bower turned 40. 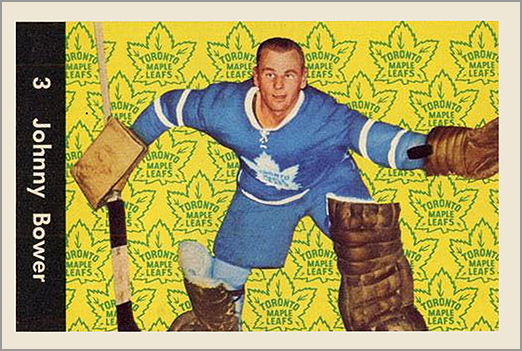 Bower started the majority of the games for the Leafs, posted a 2.25 GAA and recorded three shutouts. Although Sawchuk played more games than Bower during the regular season and in the playoffs, the Bower-Sawchuk tandem led the Leafs to a Stanley Cup Championship in 1967; this was Bower’s fourth Stanley Cup. 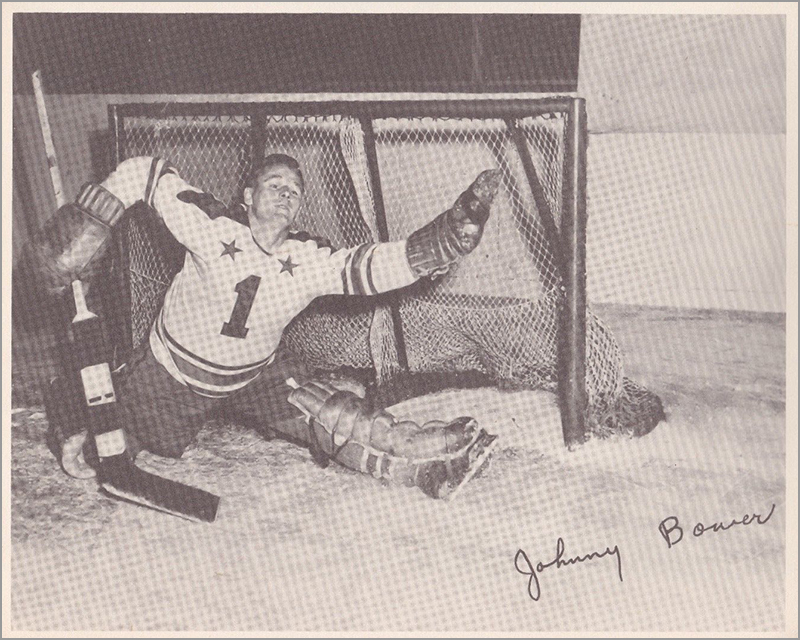 Bower played 42 regular-season games, recorded four shutouts and finished second in the league with a 2.25 GAA. 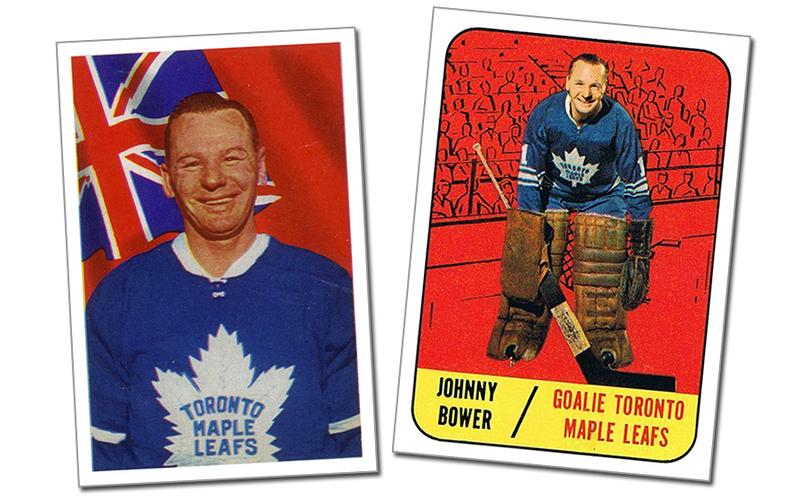 In Bower’s last full season in the NHL, he recorded two shutouts and settled into a role as the Leafs’ backup goalie. Special thanks to Hockey Media, who provided many of the images for this article. 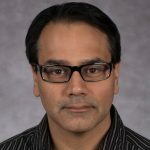 Another excellent career in cards article ! I realy enjoy those review. Thanks so much for this. I had the chance to meet Johnny a few times — a really fine guy who took the time and trouble to talk to all his fans, and was always happy to sign. JOHNNY WAS A TRULY FINE INDIVIDUAL, ONE OF THE REAL HEROES OF OUR YOUTH, WHO LIVED A LONG, HAPPY AND ENJOYABLE LIFE BUT STILL ONE WHO MANY OF US WISHED LASTED LONGER. 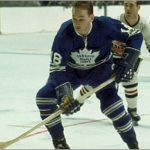 Bower was such a huge part of the hockey community in the Toronto area. Many like me never saw him play, but they were witness to his great character and being a leading ambassador for the sport. I don’t think any loss from those 60s Leafs teams will hurt as much to the fans. The Leafs are hosting a Celebration of Life for him at the Air Canada Centre this week, which is well deserved to say the least. 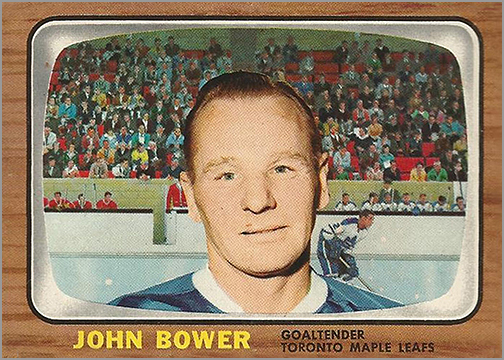 As embarrassing as it is to admit as a Leafs fan, I only have one Bower card from his playing days. 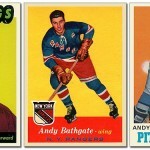 It’s the other card of his from 1963-64 Parkhurst (#65, the full body shot). I always loved the look of that set, and the fact that it pre-dates the existence of the Canadian flag adds to the charm. The Leafs pose in front of the Ontario flag, but for some reason the Habs get an ugly striped background as opposed to the Quebec flag.